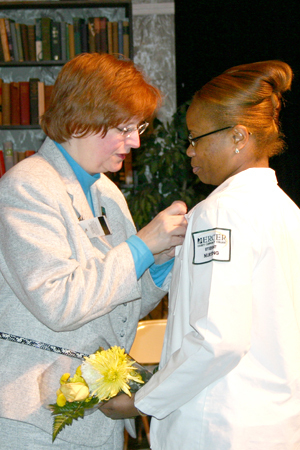 From a former photographer to a mother who went through two pregnancies during her years of study, from the student who started out with plans to be a teacher to a bartender turned caregiver, Mercer County Community College celebrated the graduation of 34 students from its Nursing program on Jan. 14. Kelsey Theatre was the scene for the festive event, which drew a large and supportive audience of faculty, family and friends. This diverse, yet motivated group came together like a family during its challenging academic journey, according to Class Valedictorian Dawn Bates, of Trenton. "We are all so different, but we have one thing in common - our love for nursing, for making the future better and for helping people in their time of need. We all have the power to make a new tomorrow. At times it seemed impossible, but we all accomplished it. Each semester we were able to push ourselves a little more." Bates noted that she had come to know every one of her peers as they all worked together to realize their shared goal. "Everyone helped each other. We really learned as a team. 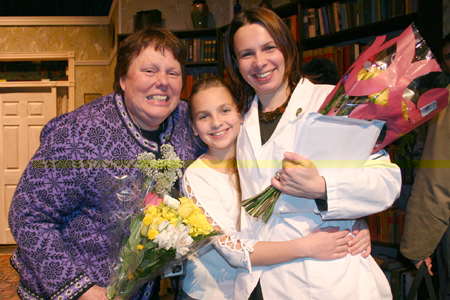 This teamwork will carry over into our nursing careers," she said. Dr. Donald Generals, MCCC Vice President for Academic Affairs, congratulated the graduates on two points. "One, you have selected a noble profession and, two, you have succeeded in it. You deserve our recognition for your impressive accomplishments." Added Dean of Science and Health Professions Linda Martin, "Our graduates have worked diligently to achieve successful outcomes in this program. You are well prepared to function as nurses: to assess your clients' health status, to analyze data, to evaluate patient outcomes, and to serve as advocates for patients' rights. We are very proud of you." In addition to Bates, a second graduate, Sharia Porter, shared her extraordinary story with the audience. A young mother who successfully completed her first semester of nursing studies in 2006, Porter was then derailed by a serious car accident. After being in a coma for two weeks and against medical predictions, Porter fully recovered and went on to complete the Mercer program. "You can overcome any obstacles with determination, faith and drive. Believe in yourself. Never give up on your hopes and dreams. People fall short too often due to lack of hope. Anything worth having is worth working for," Porter said. The ceremony ended with a standing ovation and cheers of joy. 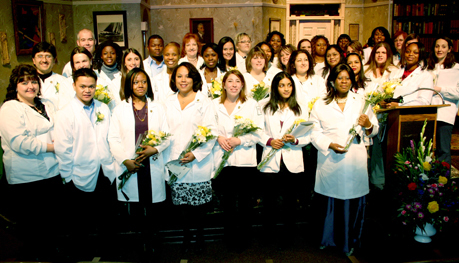 The students will follow their graduation by taking the national exam to certify them as registered nurses. 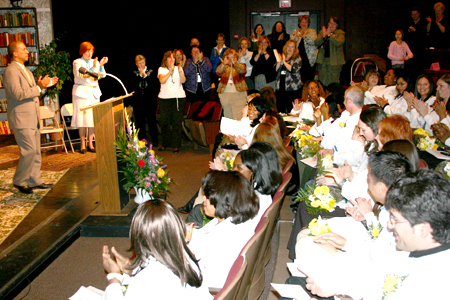 Beginning in January 2009, Felician College, of Lodi, NJ, is offering a fast-track program that enables registered nurses to earn their Bachelor of Science in Nursing degrees on the MCCC campus. For more information about the new program, read more here. 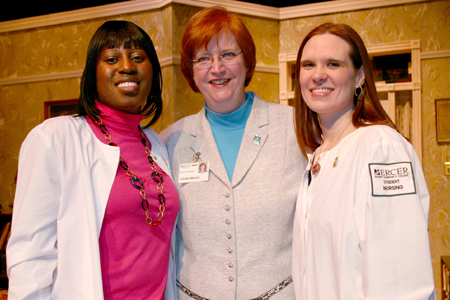 MCCC offers numerous degree programs in the Health Professions. In addition to Nursing, programs include: Health Science, Medical Laboratory Technology, Physical Therapist Assistant, Radiography and Pre-Med Biology. For descriptions, see degree programs here. nursing pin from Dean Martin. A diverse group unified by their goal to serve. Student speakers Sharia Porter, left, and Valedictorian Dawn Bates with Dean Linda Martin. language skills in the clinical setting. 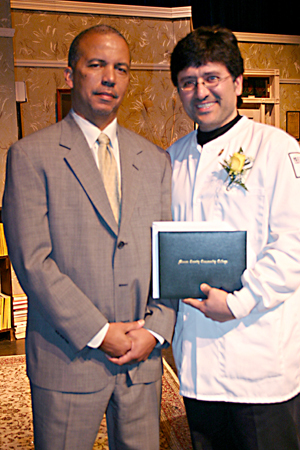 He is pictured with Academic VP Donald Generals. daughter and faculty member Sue Minkel.